Nickname: N/A Position: Baseball Ops. Home: N/A Team: PIRATES Org. In 1988, Jeff suffered personal losses when his Dad died of a heart attack. Three weeks later, his grandfather also died of a heart attack. Once the baseball season began, Jeff received word that Dr. Lockhardt, his family doctor who helped save his life twice (see below) suffered a heart attack while driving his car. He was killed when his car collided with a truck. Jeff's dream of reaching the Major League is dedicated to the three men who were so important to his life. "I think I have the talent to play in the big leagues," he said, "but I don't have a timetable. When you go to sleep at night, you don't put a timetable on your dreams." "I never ask why this all happened to me," Jeff said. "If I did, I wouldn't get an answer anyway. I don't even know if I want the answer. I just thank God for all the chances I've been given." In November 2010, Banister was one of two finalists for the Pirates' manager's job, but lost out to Texas hitting coach Clint Hurdle. Nevertheless, Banister agreed to join Hurdle's staff as the bench coach.When we had our first interview in Pittsburgh, I told Clint I wanted the opportunity to earn his trust," Banister said. "We're both big on trust. It's not just, 'Do I trust you?' It's trust to do everything we want to do in this organization." Banister, 47, has spent his entire 25-year career with the Pirates as a player and coach. He was manager at Class A Welland (1994), Augusta (1995), and Lynchburg (1996-97); and Double-A Carolina (1997-98). In 2010, Banister was promoted from minor league field coordinator to Major League bench coach after Gary Varsho was fired. "Field coordinators don't get enough credit," Pirates general manager Neal Huntington said. "Jeff developed managers. He might not have been calling the signs, but he was actually ahead of the manager to ensure we were doing the right things in managing that game." Banister first met Hurdle in 1995, when Hurdle was hitting coordinator for the Colorado Rockies. "Baseball's such a small industry, really," Banister said. "There's only 30 clubs. You see most everybody really at some point in your career, and you have conversation." Even after the Pirates passed him over as their manager, Banister emphasized he wanted to remain with the club and work with Hurdle. Banister switched uniform numbers it in memory of a fallen friend. Jeff changed from No. 55 to 17 to honor the late Ron Carelock, a childhood friend and former teammate at LaMarque High School in Texas. Carelock died in a car accident Oct. 17, 1981—a cruel twist of fate for an athlete who wore No. 10 in basketball, 17 in baseball, and 81 in football. "The school actually retired his number (17), so I asked his parents if they minded if I wore No. 17 for my senior year," Banister said. "They said it was fine because our relationship went back to our childhood days." As a player at Baytown Junior College in Texas, Banister broke his neck in a collision at home plate. A vertebrae was crushed, leaving him temporarily paralyzed from the neck down. Banister was wearing No. 17 that day. When I made my return to the field, I told myself I'd never wear that number again," Banister said. "I thought about the whole significance of him wearing it and it was the number I was wearing, and the things that had happened." In 1991, Banister wore No. 28 when he made his Major League debut. However, 28 wasn't available when he spent four seasons as the Pirates' field coordinator from 1999-2002. It belonged to outfielders Al Martin and John Vander Wal. Lefthander Paul Maholm now wears 28. Banister contemplated wearing No. 17 again when hired as bench coach by manager Clint Hurdle, but infielder Josh Fields had it. In 2015, Banister was named the AL Manager of the Year, awarded by the BBWAA. Jeff was a minor league catcher during his playing career. He reached the Majors, with the Pirates, for one game, in 1991. In his only Major League at-bat, he singled off the Braves RHP Dan Petry. He spent only five days in The Show. All of his pro playing career was in the Pittsburgh organization. Bannister was an overachiever in the minors. Bannister endeavors to draw his team together via contests, etc. For example, during 2016 spring training, Jeff called for a free-throw contest. And utilityman Hanser Alberto won the competition. OK, so it’s not Baseball by the Book. It is, however, Baseball by Banister, with an assist from Clint Hurdle, the Pirates’ manager. After 25 years in the Bucs organization as a player, a minor league manager and a coach, Banister was introduced to Hurdle, who became Pittsburgh’s manager in 2011. And during the course of that spring, not only did Banister get to know Hurdle, but he got to know himself, too. 1994: Manager at Welland (NYP-Pirates). 1995: Manager for Augusta (SAL-Pirates). 1996-1997: He moved up to Lynchburg (CAR-Pirates). June 20, 1997: The Pirates moved Banister up to Double-A Carolina in the Southern League to replace Marc Hill who became a roving catching instructor in the Pirates' organization. In 1998, Bannister was on the Pirates coaching staff. In 1999, he became a coach with the Pirates, working as a Major League field coordinator. He was in effect, a seventh member of Gene Lamont's coaching staff. The Pirates fired manager Gene Lamont, Jeff and the rest of the coaching staff the day after the 2000 season. 2001-2004: Bannister was the Pirates' minor league field coordinator. June 2004: Jeff took over for Jay Loviglio, who resigned as manager of the Lynchburg Hillcats for personal reasons. But Bannister was back to his role as minor league field coordinator at the end of 2004. August 8, 2010: Banister replaced Gary Varsho as Bench Coach of the Pirates. 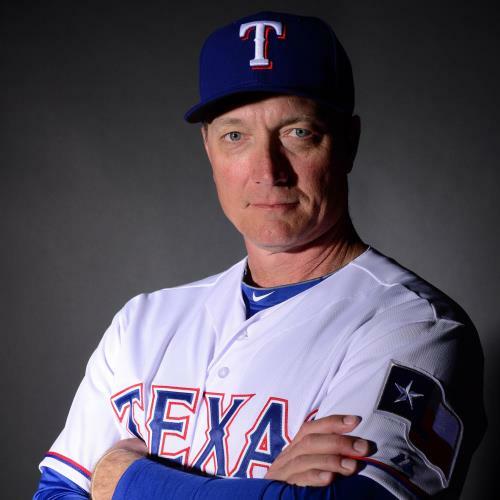 October 16, 2014: Banister won the job as the Rangers' manager. February 19, 2016: After he won the AL Manager of the Year in 2015, the Rangers extended Jeff as their manager through the 2018 season. November 6, 2016: Banister served as the honorary pace car driver for the Texas 500 at the Texas Motor Speedway. September 21, 2018 : Jeff Banister was let go as the Rangers manager. 2019: Banister returned to the Pirates as Special Assistant in Baseball Operations. Jeff has been operated on 12 times. He had osteomyletis, an infection of the bone marrow usually caused by a bacterium. He underwent surgery seven times for that while in high school. Then, while in college, Jeff was involved in a home-plate collision and broke three vertebrae in his neck. He underwent surgery three more times. Throw in two knee operations and you have a real hospital animal. In 1982, Jeff was a junior in high school. That's when he noticed a strange swelling in his ankle. He thought he twisted it during a football workout. The family doctor, Leroy Lockhardt said it was a form of cancer. He said that if Jeff didn't have his leg amputated above the knee, he would die. The night before his scheduled surgery, Jeff and his dad had a long talk. He wanted to live, but he did not want to lose his leg. "I always wanted to play sports," Bannister said. "I told my dad I would rather die than lose my leg. We hugged each other and cried. Baseball was everything to me and if I couldn't play, I didn't want to live anyway. He said it was my choice and we would live with the outcome." The surgeons were able to save Jeff's leg. But it took seven operations; and he spent a year in the hospital. Two years after beating cancer, Jeff was a catcher at Lee Jr. College in Baytown, Texas. He tried to block home plate to prevent a run from scoring. The runner tried to jump over Jeff, but his knee hit Banister's head, shattering three vertebrae. "I couldn't move. I thought I was dead." Back in the hospital, Dr. Lockhardt and Jeff's father were at his side. The doctor advised Jeff's dad that a sneeze, cough, or sudden jerk could interrupt his son's breathing and kill him. He was paralyzed for a week-and-a-half and underwent three operations. The specialists were convinced Jeff would spend the rest of his life in a wheelchair. But his strong will prevailed. Bannister went on to play at the University of Houston and graduated with a degree in sports administration.